Forget Mona Lisa’s smile. 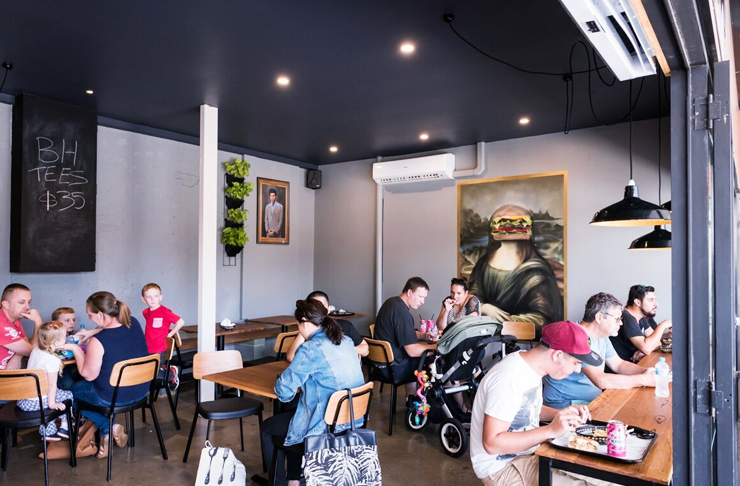 At Burger Head, the new burger joint in Penrith, the iconic work has been reimagined. In fact, the large mural has forgone Lisa’s head in favour of—you guessed it—an oversized burger. Burger Head is the creation of Sydney chefs Josh DeLuca, Richard Borg and Tim Rosenstrauss. The trio met while working at Surry Hills restaurant Master (now closed) and each own a CV peppered with fine-dining experience including time at Momofuku Seiobo and Quay. It was DeLuca who first flagged the idea to bring next-level burgers to Sydney’s west. 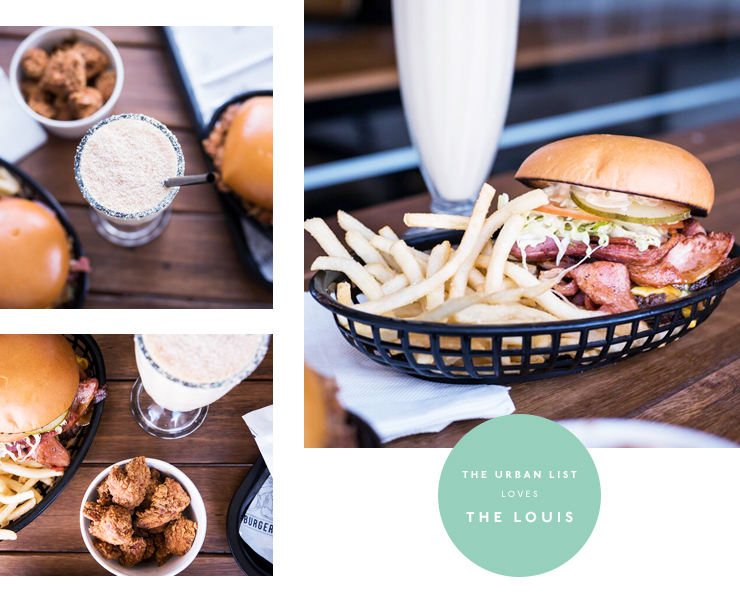 He and Borg are both ‘Westies’ and all three thought the time was right with the recent burger explosion not quite stretching as far as Penrith—until now. The Burger Head menu is small, featuring just four burgers (all served with fries) and a few sides, but it’s all part of the plan, according to DeLuca. Simplicity is the name of the game here, so check any ideas of fancy menus at the door. You won’t find any crazy, massive offerings, rather a focus on what the guys here see as the perfect burger. It was safe to say we were hungry and damn well intrigued at this point. We ordered a white choc shake (with salted, caramelised and roasted white chocolate) and it was delivered almost immediately. It’s the only house made drink on the menu, but there are plans to introduce other flavours. Depending on your love for the sweet stuff (and this coming from someone who will happily stick a soup spoon in a jar of Nutella), we struggled to finish this one but it was delicious. Our food was pretty quick to arrive, too; delivered on a takeaway-style tray with the burgers and fries presented in black retro baskets—you know the ones; they’re doing the rounds. The ‘crispy bites’ were begging to be pounced on so I kindly obliged. The buttermilk-soaked chicken tenders were moreish, even more so when dipped in the house made sweet and sour sauce—a highlight of the visit. Meanwhile, the potato and gravy—silky and ever-so-slightly sweet—leaves the Colonel Sanders’ for dead, although you’d hope as much I suppose. Now for the burger. Of our two choices, The Louis was the pick. It’s a juicy beef burger with caramelised onions, lettuce, tomato and pickles. We added bacon for a few extra bucks and it was a good decision. The Clucker sports buttermilk chicken fried and seasoned in a 12-spice mix—another victory over the Colonel—with malt-pickled onions and mayo. Lots of mayo. Depending on your love for the white stuff, maybe a little too much mayo. But it was still very, very tasty. There’s also a vege burger on the menu, named for controversial boxer Mike Tyson who, so I learned during my visit, was a vegan for a short while recently. Too bad for Evander Holyfield the conversion didn’t come sooner. No ears on this burger; just mushrooms, kale and cabbage. So nice, so I am told, it’ll even impress the most dedicated of carnivores. The fourth and final burger on offer is the classic cheese. The menu is a bit on the exxy side—you’ll pay $18 for both The Clucker and the Mike Tyson—but you’ll soon forget about the bill. The guys are applying for a liquor license so it could be beers and burgers soon. Nothing wrong with that idea! Check out more great food Sydney has to offer with these Cheap Eats.